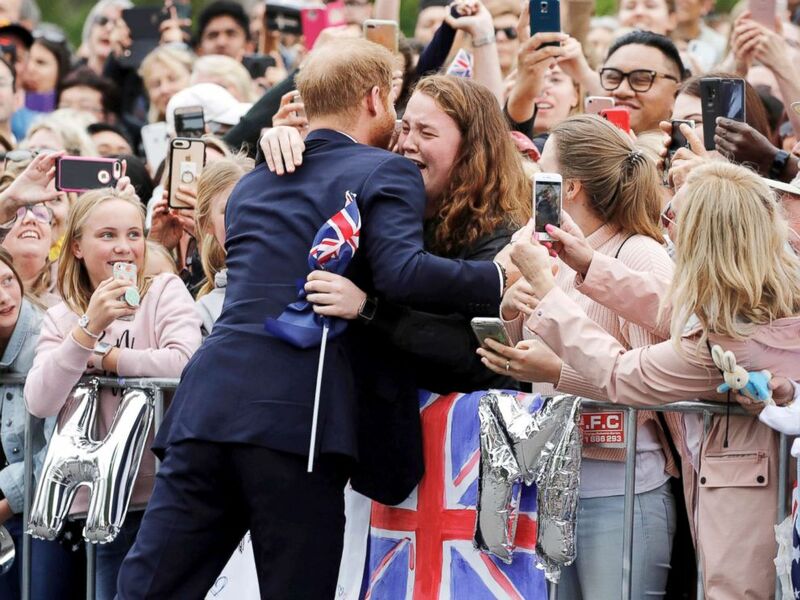 Prince Harry and Meghan Markle spent the third day of their Australia tour in Melbourne, where they met with members of the public, including one Harry fan who broke down in tears when he stopped to hug her after spotting her sign in the crowd. Harry found the sign in the crowd, and as he gave the well-wisher, identified as India Brown, a big hug, she could be seen breaking down in tears. Meghan, Britain’s Duchess of Sussex, speaks to members of the public as she arrives at the Royal Botanic Gardens in Melbourne, Australia, Oct. 18, 2018. Meghan has continued to engage in diplomatic dressing, like her sister-in-law Kate, when she also travels on behalf of the royal family, this time donning a Dion Lee maxi dress and Martin Grant trench coat, both made by Australian designers. The so-called “Meghan effect” or “Markle Sparkle,” where just about everything the duchess wears sells out instantly has been a staple of the Royal Tour this far. Today was no exception: Dion Lee’s folded sail dress was instantly besieged with online requests, causing the company’s website to crash. The dress, which was a custom-made bespoke dress for Meghan, will reportedly become available later this week. Earlier today in an Australian TV interview, the CEO of Outland jeans revealed the company had sold out every pair of the ethically-sourced jeans Meghan wore during her engagement in Dubbo, Australia, yesterday. The jeans benefit women who have survived the human trafficking in Cambodia. Prince Harry and Meghan Duchess of Sussex are pictured as they tour Australia, Oct. 18, 2018. 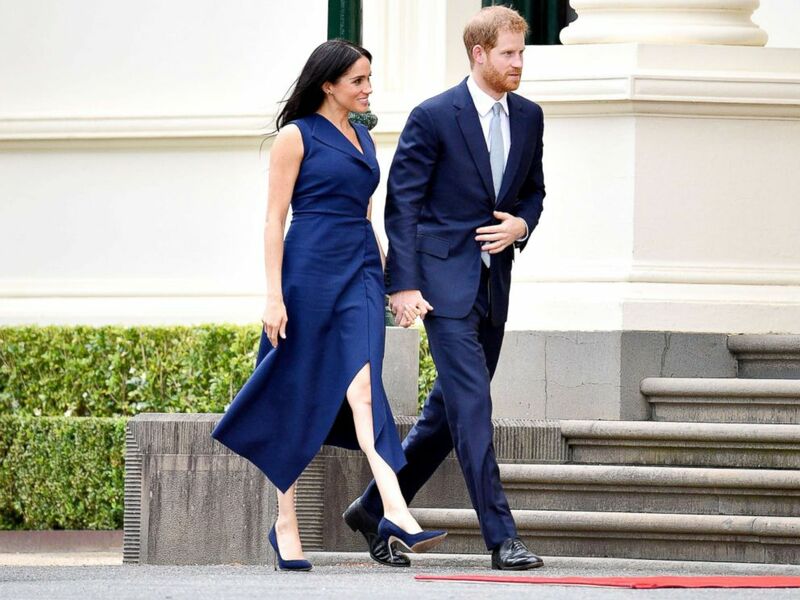 The royal couple are not spending even five hours on the ground in Melbourne, and their first stop is the Royal Botanic Gardens Government House. The couple will then head to a young Victorian leaders reception inside Government House, hosted by the governor of Victoria. Meghan and Harry are also taking time to meet with young women from the This Girl Can campaign, with Meghan even taking part in some spirit drills. Meghan has long been an advocate of women’s empowerment. Since her marriage to Harry, the couple have together supported programs that encourage training for women in STEM subjects of science, technology, engineering and math. It’s expected women’s empowerment, gender equality and education will be key themes in her future work as the Duchess of Sussex. Harry was recently named Commonwealth Youth Ambassador by Queen Elizabeth, and this is an opportunity to connect with the next generation of leaders in Australia. One-third of the Commonwealth is represented by those under 30, and Harry and Meghan hope to listen to their ideas and concerns. Britain’s Prince Harry hugs a member of the public as he arrives at the Royal Botanic Gardens in Melbourne, Australia, Oct. 18, 2018.